Now, with their friends and enemies alike - Blue, the biker; Keiran, the folk musician; the Inspector from the RCMP; and the mysterious Tom Hengyr - Sara and Jamie are drawn into this enchanted land through the portals of a sprawling downtown edifice that straddles two worlds. From ancient Wales to the streets of Ottawa today, Moonheart entrances listeners with its tale of this world and the other one at the very edge of sight. A tale of music, motorcycles, and fey folk beyond the shadows of the moon, Moonheart is pure magic. ©1984 Charles de Lint (P)2008 Blackstone Audio, Inc.
, with stories within the story, my interest was held throughout. my first book by Charles de Lint, certainly not my last. I remember reading de Lint way back when and eagerly awaiting his next offering. I was somewhat younger then and found the books both original and fascinating. Older, wiser, more experienced and a little more cynical - how does it stack up? Well yes methinks it does. Not quite as riveting as 30 years ago but still a good listen. Certainly worth a try for anyone new to the works and I would be happy to revisit other offerings. I debated for a long while whether or not to use one of my precious credits on this book. I'm glad I did. I really enjoyed learning about the Celtic and Native American mysticism since it's an area I'm fairly unfamiliar with. With much of the fantasy stories out there right now being about vampires and werewolves etc. (don't get me wrong, I like those too) I found this story refreshing and different. I saw an earlier review stating the story jumped around a lot. I actually really enjoy stories with multiple storylines and characters as it helps to draw me into the story even further when I can try to figure out how they all come together at the end. The only reason I gave this four stars was, with so many characters involved, the narrator seems to have a hard time finding voices for them all. There were times where it was tough to figure out who was talking if it wasn't specifically written in the book. He's got the main characters down though so the issue is a minor one. If you're looking for an interesting and different read this book is a good choice. Happy listening. 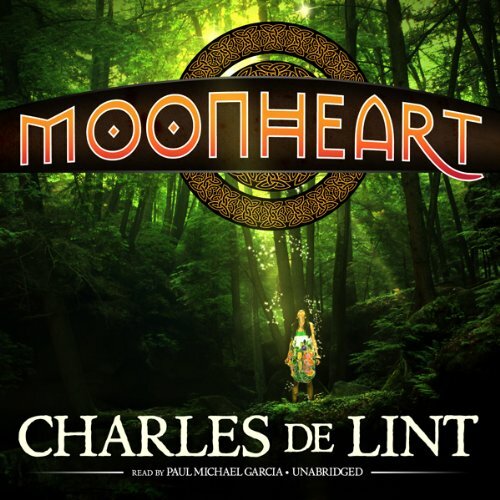 I have read many of Charles de Lint's books, including Moonheart. This is the first time I have listened to one in audio format. I found the narrator has really told the story very well and crosses back and forth between characters with amazing clarity, for a book with so many characters. This audio book is of excellent sound quality and a great story by a great author. The story focuses around a woman named Sarah and the people in her life she has surrounded herself with, including a strange character - The Tamsind House. The Tamsind House (may be misspelled) is where she lives with her uncle and an assortment of characters who have found themselves there. It is communal and any traveler is welcome. The house is magical and seems to provide what you need, whether you have consciously asked for it or not, and it is ever changing. Sarah works at a antique store that her family owns despite a lack of need. She is wealthy. Through her work she find some items, "treasures in the rough," that seem to not make sense how they got there and have magical qualities. These items transport her and her self made family into an alternative universe where native american and celtic magics exist. Sarah's family, some wizards who follow "The Way," and a government agency are all trying to find an individual, magic, and items that will determine if good prevails over evil. This is fantasy and coming of age combined. It definitely has a 70's feel to it with communal living and government investigation of the paranormal. It deals with the effects of the entrance of caucasion peoples on Native American land and cultures in DeLint's alternate universe. I love DeLint. I have really enjoyed The Onion Girl and Widdershins. This book did not feel as strong as some others of his. The characters were not as developed, however, I feel you can still attach to them. There, however, is a lot going on and at times it felt certain story lines were not as flushed out as they could have been. They felt briefly touched on. When I finished I was left wanting. Regarding the narration, I found myself missing Kate Reading, the narrator who has done several other DeLint books. It's not that Paul Michael Garcia is bad, but I felt his interpretation of the characters did not help DeLint's less than perfect character development. The concept of the book is interesting and I liked it, but I don't think I would listen to it a second time. I was really captivated by this book. I absolutely love the twist on Welsh mythology and giving mythological characters a new life. I also love how relatable every character is, they all have strengths as well as flaws. Although I did find it really obvious which characters he was going to kill off, it was always the ones you weren't very attached to. I also loved the crossover between Welsh and Native American with a time travel twist, really interesting. Where does Moonheart rank among all the audiobooks you’ve listened to so far? I liked the different characters and the way they each looked at what was happening from their own point of view. I liked the gentle philosophy. The characters were interesting and sympathetic. Each one developed through the story. The story moved from the real world into the alternate reality very smoothly. I only found Charles De Lint a couple months ago on audio and I'm quite hooked. I like the worlds he creates and magic his characters discover. If you like fantasy novels you will enjoy this one. This was a VERY good book, with what I thought was an appropriate narrator. Yes, some topics interrupted the storyline, but the whole thing wove together fabulously. Sara and her uncle Jamie live in Tamson House, the old family mansion that takes up a street block in Ottawa. While Sara runs their cluttered curiosity shop, Jamie spends his days studying the arcane and playing host to the eccentrics and homeless people who come and go through Tamson House. Sara and Jamie?? ?s interests collide when Sara discovers an old gold ring that seems to draw her into an ancient past ??? a past where Welsh and Native American mythology comes alive. But not only does the ring pull Sara in, it draws Tamson House, and all its occupants, with it. Moonheart was a truly satisfying read for me. I fell in love with Tamson House ??? just the idea of a big sprawling mansion that exists in two worlds is enough to fascinate me. Tamson House was my favorite ???character??? in Moonheart but, as rarely happens, I liked almost all of the characters in this novel. They feel real and alive, with distinct backgrounds, personalities, and motivations. I enjoyed watching them react to their strange situations and interact with each other. Another aspect of Moonheart that works especially well is the mix of the modern and ancient. It doesn?? ?t feel at all unreasonable when Blue is racing his motorcycle through ancient Wales. In many ways, Moonheart reminded me of Robert Holdstock?? ?s Mythago Wood and Lavondyss, two of my favorite fantasy novels. In each of these stories, an old house exists in both the modern world and on the edge of an old dark forest full of myth and legend. I suppose I just can?? ?t resist this type of story and de Lint does it so well. There is plenty of mystery, suspense, and action in Moonheart, and even some terror, too. I was completely enthralled the whole way through as I listened to Paul Michael Garcia superbly narrate Blackstone audio?? ?s version. Moonheart is an enchanting story. Loved it just like the first time I read this so many years ago! will definatly read it again!